Remember when Sharknado blew through everyone’s homes a couple months ago? All those sharks had to be buried somewhere, right? But you would’ve thought they’d build the box big enough to actually hold a shark. All kidding aside, the shark coffin (unlike the Bacon Coffin that we featured a while back that’s actually a real coffin) was created by an advertising group in Shanghai for China’s International Fund for Animal Welfare. IFAW is hoping to bring awareness to the overfishing of sharks in the country. 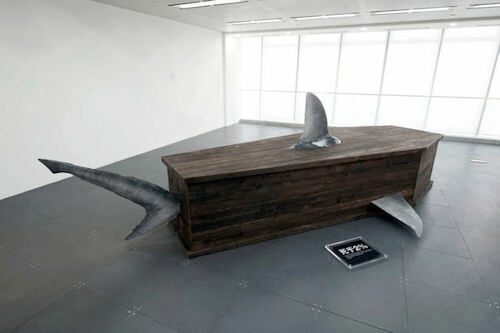 The agency’s shark coffins have popped up all over Shanghai along with an attached plaque explaining what’s going on and urging people to sign a petition to help the ocean’s top hunters. 50,000 people have signed that petition. You are currently browsing the archives for the Coffin category.